This guide is to help supervisors in their responsibility of conducting incident investigations. It includes information and explanations on how to identify the root causes of an incident, the corrective actions to be implemented, and how to monitor the effectiveness of the changes made. In order to discover the root cause(s) of an incident or near-miss, you must reconstruct the chain of events and decisions that occurred prior to the incident. Be open-minded because it is easy to jump to conclusions. Be sure to focus on the events that did happen instead of those that were supposed to happen. Assigning blame to employees is not the purpose of this program. Supervisors should use a team approach to determine all causes of the incident. Employees feel valued when their input is requested to identify hazards, causes and effective solutions. At a minimum, the injured employee’s supervisor, the SUU Safety and Risk Management Director and the injured employee should be involved in the incident investigation. Maintenance employees, engineering staff, safety committee members, etc. are often an asset in the gathering and processing of information and determining corrective actions. Compliance with workplace changes is much easier when input is obtained from employees. After gathering as much information about the incident as possible from the injured employee and any witnesses, the investigator(s) will identify the root cause(s) and contributing factors to the incident or near-miss. The simplest method is known as the “5 whys.” In this question-asking technique, the investigator asks the same question repeatedly: “What caused or allowed this condition/practice to occur?” or simply “Why?” – until the root cause(s) are found. The example below illustrates how the 5 whys might be applied to an incident. A worker loses the tip of his finger when it was crushed between a drive belt and an unguarded pulley. Why was the worker's finger crushed? - His finger was caught between a moving pulley and belt. Why was the finger caught between the pulley and the belt? - The guard on the pulley was missing. Why was the guard missing? - A mechanic had overlooked replacing it. - There is no written equipment servicing checklist. Why is there no checklist? - No hazard assessment has been completed. After the root causes are identified, Supervisors must identify corrective actions to reduce or eliminate those hazardous conditions. The manager/supervisor and employees will develop and propose specific improvements that are operationally feasible and are based on risk and opportunity of exposure. As a minimum, for serious incidents or near-misses, the SUU Safety and Risk Management Director, or their designee, should participate in the incident investigation and determination of solutions to prevent recurrence. When selecting and recommending these corrective actions, possible solutions will be prioritized using the following hierarchy of controls. 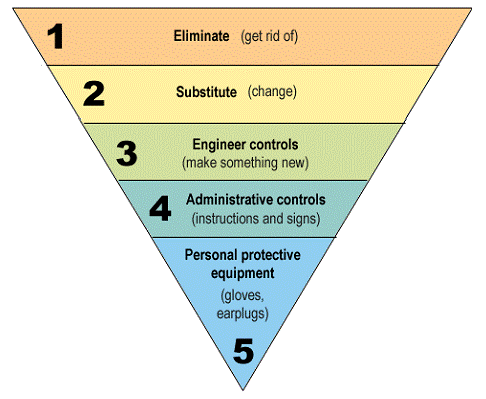 In this hierarchy of hazard control, the most desirable solutions come from the first level, with the following levels offering increasingly less desirable options. Personal protective equipment – using respirators, earplugs, safety glasses, etc. Corrective actions need to be as specific as possible. To state, “Be Careful,” is not an acceptable corrective action. Once implemented, corrective actions need to be monitored by the manager/supervisor for effectiveness to verify that net risk has been decreased, and to determine that the root cause of the incident has been eliminated or reduced. Where appropriate, the manager/supervisor should conduct follow-up interviews with employees who were part of the incident investigation to determine if the implemented corrective actions require any adjustments to provide maximum safety to the employees. The Safety and Risk Management Director will review the corrective actions with the supervisor to ensure that the corrective actions remain effective.